This one-of-a-kind collection consists of actual cases written by fraud examiners out in the field. These cases were hand selected from hundreds of submissions and together form a comprehensive picture of the many types of computer fraud and how they are investigated, across industries and throughout the world. Topics included are email fraud, on-line auction fraud, security breaches, counterfeiting, and others. 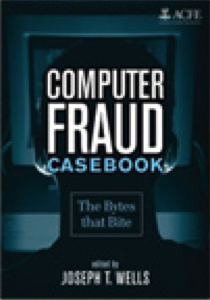 Harry Cendrowski and Jim Martin contributed a chapter to this important text on fraud examination.